Piranha Games announced yesterday that, nearly two years after Mechwarrior Online went live, European servers are now operational. The studio said the new servers will improve ping times for European players by an average of 50 percent. 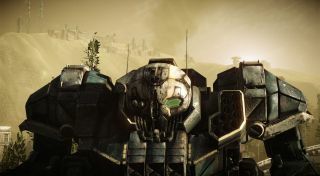 Mechwarrior Online is entering its "final phase of feature implementation," Piranha said in a statement, which includes leveling the competitive playing field worldwide by rolling out new server locations. European players account for nearly 40 percent of the total Mechwarrior Online player base, according to the handy infographic below. They also have a better win/loss and kill/death ratio than North American players, and for some reason seem to have a preference for the Lyran Commonwealth. "The MechWarrior Online community has always been competitive by nature given the fundamentals of the MechWarrior gameplay, and now that we've added European servers a huge portion of our player base that lives in that region can experience MechWarrior Online at the highest competitive level," Piranha Games President Russ Bullock said. Mechwarrior Online has evolved at a slower pace than was expected in the early days—Community Warfare, for instance, was "projected" to be added within 90 days of the launch of open beta, which began in October 2012, but wasn't actually implemented until more than two years after that—but it does seem to have picked up the pace since Piranha acquired the full rights to the game from original publisher Infinite Games and committed to "more efficient development." To celebrate the launch of European servers, Piranha is holding a "European Takeover" event, beginning at 1 pm PDT today and running until midnight on July 31. Get the details at mwomercs.com.